As I have already referred to in a previous post, Lima has a kind of on-the-shadow recycling economy that is carried out by low-income and very-low-income sectors as full-time and as part-time jobs. What surprised me recently was to discover the regional scope of this activity. 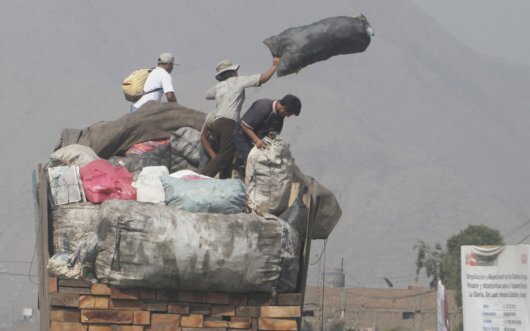 On the outskirts of Lima, on the road that connects Lima to cities in the highland and jungle regions, there is a cluster of the recycling economy. The truck in this picture is discharging separated trash that was brought to Lima from outside the metropolitan area. The factories that process the trash this truck is transporting, mainly plastic bottles, operate in Lima. In the truck just below the trash, you can see timber from the Amazon jungle, at least 300 miles away from Lima. I wonder if the economic growth that is taking place in Peru will reinforce of undermine the recycling economy. Photo and post by Sebastiao Ferreira. This post is number 13 of 52 in Sebastiao’s 52-week photo journal. I was very lucky for this picture. I found the truck discharging these bags of trash, and I waited for meaningful movements. Then, this woman started to prepare to throw that huge pack, and I could capture her in action. The timber below the trash called my attention, because it defines the origin of the truck, meaning the it is coming from somewhere in the jungle.